A resounding efkharisto (thank you!) 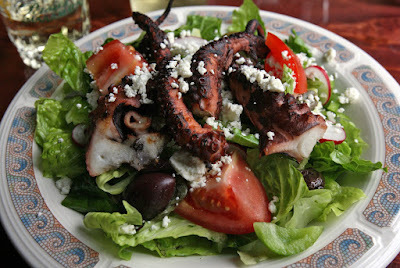 to scores of readers who shared with me their Greek food go-tos: from the corner gyro joint to the Greek diner hangouts to the sit-down-dinner places where I might lift a glass of retsina and say, “Here’s looking at you, squid!” Their “bests” included many of my favorites. Did we miss yours? Feel free to join the chorus. Whether they’ve got a taste for gyros or Greek omelets, arni psito or pastitsio, long-timers pledged their allegiance to a Greek fleet of familiar names. “Mr. D’s at Pike Place Market is the best for a run and grab lunch,” says a fan of Demetrios Moraitis’ gyros. “Just be prepared to have happy onion/garlic breath the rest of the day.” No lie! “Hey Mom, got any Altoids?” asked my son, Nate, after we dined and dashed last weekend at Pike Place Market, where Mr. D’s is temporarily doing business out of a big red truck due to Market construction. 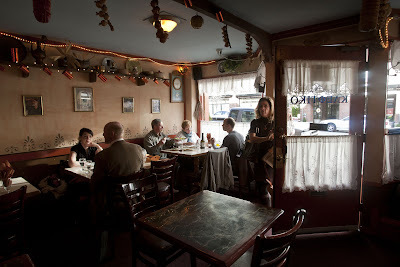 Panos Marinos runs what many insist is the city’s best Greek restaurant: Lower Queen Anne’s tiny taverna, Panos Kleftiko. Have the sausages! they say. No, the lamb! 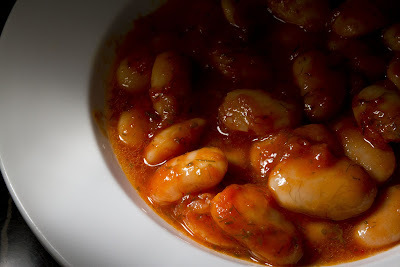 Don’t miss his yigantes yahni (gigante beans)! Fried calamari with skorthalia at Georgia’s? Come on, take a dip. For “fancy” Greek food I’d be quick to send you to Vios Cafe, now with two locations, on North Capitol Hill and in Ravenna. And I’m not alone. Owner Thomas Soukakos’ casual, kid-friendly cafes appeal to diners intrigued by the clean-tasting flavors (have a meze plate with souvlaki, and pick and choose among daring dips and sensational salads).” I’d also suggest Tom Douglas’ downtown restaurant Lola, where Greek-accented fine dining is adapted with Northwest know-how. Lamb souvlaki mezze plate, plus avgolemono at Vios (left), and a Northwest mushroom skewer with Greek Salad and “smashed potatoes” at Lola. 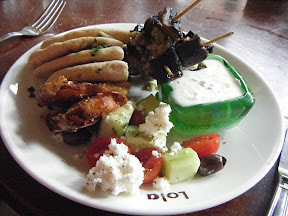 West Seattle is crazy for Kokoros Greek Grill, as are fans from elsewhere. It’s small, and parking’s a bear, they say, but their gyros are tops, and “If I didn’t have to drive from Kirkland for my Kokoros fix, I’d be there daily,” notes one regular. The avogolemono at Ballard’s Plaka Estiatorio is “better than my mom’s,” says a fan. OK, I’ll try it. And I’ll also try Plaka’s Papousakia — “a lush casserole of eggplant and minced lamb,” according to Seattle Times critic Providence Cicero. Gyros is the call-of-the-day at crowded cafes like Kirkland’s Santorini Greek Grill, where the speedy crew slice spit-roasted lamb and beef and stuff it into pita or serve it on their popular gyros salads.